Well, this may look like a deep, royal purple, but the color is actually much lighter - and pinker, than as shown here, of course your perception may vary (the color of the ink in the writing sample is just a bit lighter than the actual barrel color). I have used the red, blue, and black G-2s, but this was my first experience with the purple ink G-2. I thought the pen performed quite well, and the .5 point size dried faster than the .7 and was not as scratchy as the .38 G-2 can be. I liked the color quite a bit, though this will not be in my rotation (actually my girlfriend nabbed this one right off my desk when the writing sample was complete). But I think that anyone that likes different shades of purple and .5 gels will enjoy this pen. And look! The gel inside the refill doesn't have that weird orange tinting like the black refills do. The clip, grip, and barrel are all otherwise the same, and I'm assuming most, if not all of you, have tried the regular G-2 at some point. I do think that Pilot needs to revamp the barrel a bit, but it might be hard for them to justify changing a classic, especially when it is still one of the most prevalent gel pens on the market. Looks pretty good, right? I think so. And I'm glad that Pilot took the time to add additional colors to the lineup. As it stands, this is a very solid pen that has no real flaws to speak of. I'm always on the lookout for the perfect plastic-tipped pen, and I thought this looked appealing when I was rounding up my last JetPens order. I don't meant to say that I can't recommend this at all, the writing performance is quite nice, but I don't think the tip is going to last very long, and neither will my fingers due to the sharp plastic edge where I like to hold the barrel. Price is another issue; this pen is significantly more expensive than the other disposable plastic-tipped pens. At $4.70/each, there is nothing about this pen that should warrant the price different between this and other favorite, like the Copic, Sakura, and Sharpie plastic-tipped pens. As you can see, the point is very tiny, and the pen, as a whole, is quite "technical" looking. There is a disclaimer on the barrel - "Don't press pen point hard to avoid damage of it." Heed this warning, because the tip was changing shape after just the writing sample - not a good sign. In this comparison of the Neopiko with a Sakura Pigma Micron, you can see how different the "grip" area is; the Sakura is more graduated, and thus more comfortable than the Neopiko. Between this, the cost, and fragility of this pen, I cannot recommend it over other comparable selections. I have to hand it to Staples for attempting to make a variety of their house brand pens to accommodate different tastes. In this case we have a .5 tip (small for many brands), and a needle point. I'm glad to see needle points become more prevalent as I tend to like these more than conical point pens. I think the barrel, overall, looks somewhat like a Uniball Vision Elite. The grip will likely remind you of a Pilot Precise, but it has a grippy material that is quite nice and comfortable to hold. The grip material is the type that does attract dust and debris but, because the pen is capped, it is not as likely to look dirty like many retractable pens do that utilize the spongy rubber material. Not a bad design on the clip; it's functional, but does feel fairly fragile. So, what about the writing performance? Not bad at all, but there are other, more superior options than this. I always like to try and support the underdog but, more often than not, they can not provide a better value than the big names, which is exactly the case with this offering. At any rate, if house brands start to compete with the big name brands, it goes to show that they are listening to what people want and making the effort to win our money. At the very least, it worked on me. I know, I know, my posts have been less frequent as of late, but I am about to provide proof that I have been working on other passions. To record one of my other hobbies, homebrewing, I chose to start using a Quo Vadis Habana that was generously given away by Note Booker, Esq. This is the 2nd generation, U.S. version, which consists of 85gsm paper and dimensions of 6.25 in x 9.25 in. What's more, this paper is ivory, rather than the white paper used in the original version. I think it's great to see the writing of the original owner. In the back pages are the writing samples from Note Booker. Here is what he said about it. This is a very hoppy India Pale Ale. So, I mentioned beer. For the last 6 weeks, I have been brewing some delicious homebrew. Well, the first one was tasty, but I am still waiting for the other two to be finished in the fermenting and conditioning phases. 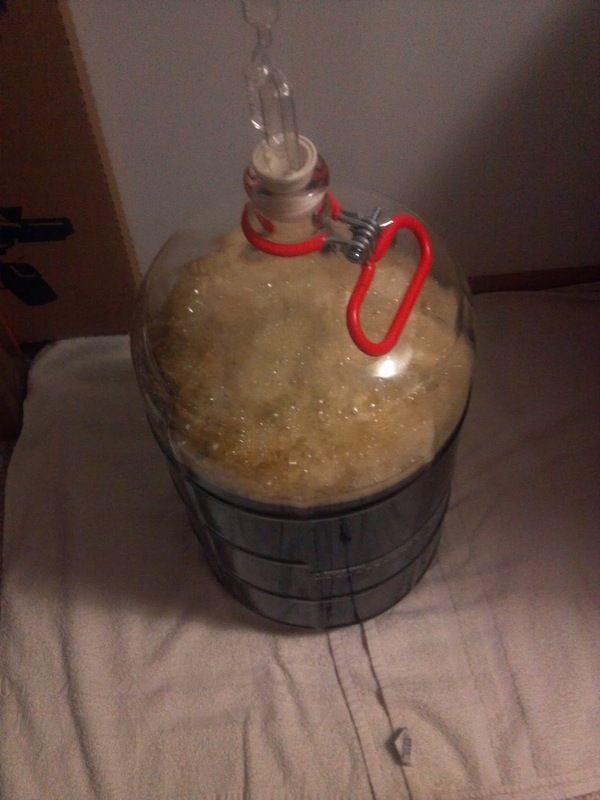 Brewing is a very finicky process, though fermentation, as a whole, is not. 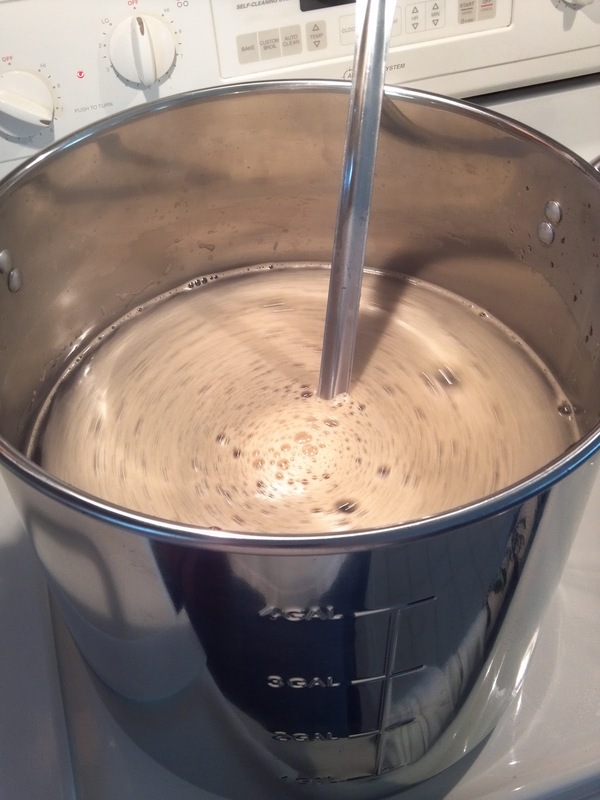 Yeast + sugar = carbon dioxide and alcohol. Even squirrels can experience the fruits of fermentation when pumpkins are left on the porch. To make sure timing, ingredients, and process are being followed, it is important to take notes, which I have done in the Quo Vadis Habana. 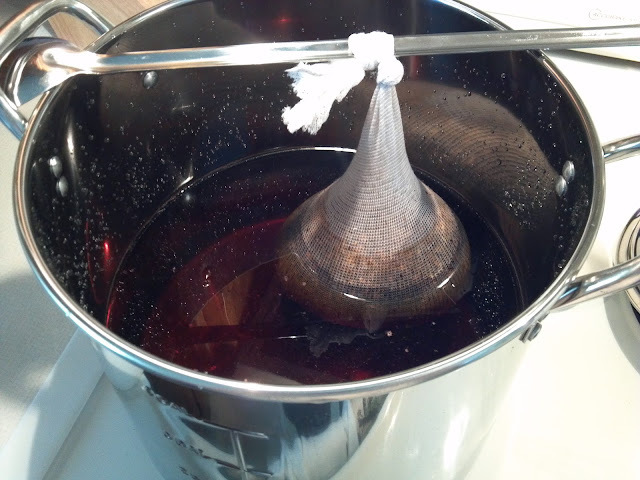 Here are my notes from making a porter which was then infused with coffee. The end result was dry, roasty, and somewhat cocoa-powdery, with a heavy nose of medium-roast Sumatran coffee. Though delicious, I have some components I would like to change, and the record-keeping will allow me to see exactly what I did to get my initial result. Regardless of whether or not I used a felt tip, fountain, liquid ink, gel, or ballpoint pen, each performed beautifully on this paper. One concern might be drying time, so be careful with larger diameter gel pens (1.0 mm Pilot G-2, Medium+ nibs on fountain pens, or some liquid ink pens). Outside of that, I have zero complaints about this notebook. Any additional notes and research will be filed away in the sizable pocket located in the back of the notebook. 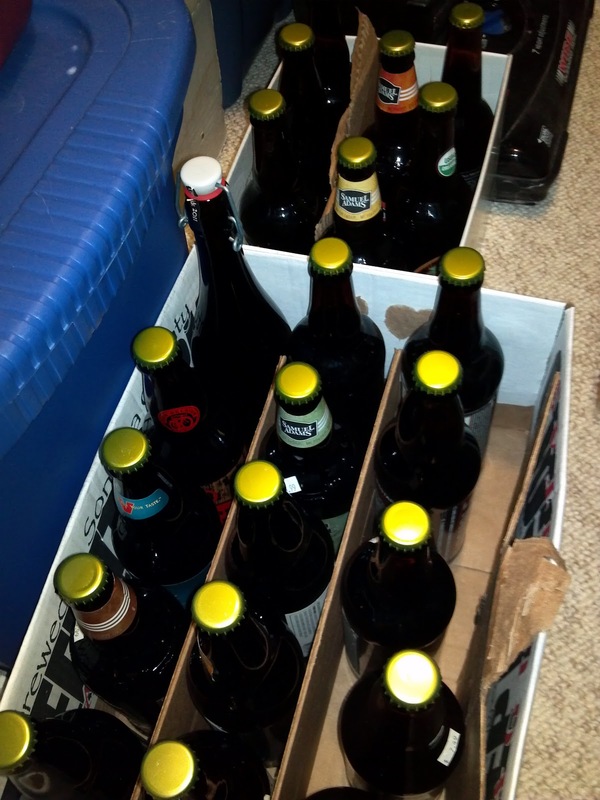 I don't make my own bottles (which would be awesome); these are from other producers. It's also important to keep track of notes when you are in possession of so many gallons of beer. Each batch is approximately 5 gallons. Waahoo! Never mind the vacuum seen in this photo - chores are way more boring than pints and pens. If you're not a fan of beer, try branching out and sampling some fine ales. My passion for beer is similar to that of any artisan-based passion in the sense that craft prevails over mass production. Maybe not in cost, but in quality and experience.